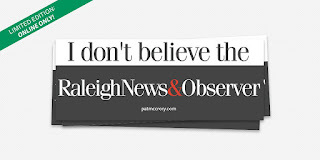 McCrory is selling this bumpersticker for $5. We expect it to sell like hotcakes to people who like beating the air with their gums more than they like the truth. McCrory can't change the story of his bumbling, crony-infested administration, nor the various fibs he's been caught peddling. So he's attacking the press. Idiots, Mr. Williamson ? Is that your opinion of the average man and woman on the streets of this state ? No, not them. Only people who believe it's all the fault of the press. alas, very few people anymore. Just us sheeple.